Out of all the different wedding decorating you will do for your big day, your wedding getaway car is the place where you design with the most emphasis on your relationship type. Whether you are a sporty couple, a stylish couple, a classic couple or a modern couple, your relationship’s specific style or your shared interests are usually somehow incorporated into the getaway car’s decorations. Getaway cars also offer a lot of freedom with the design. If you have a color scheme or design scheme throughout your wedding, you can match your getaway car to it, or you can have fun and do something different that matches the season or complements the color and style of the car that you chose for your getaway. We carry some beautiful accessories for spring, summer, autumn or winter weddings that your guests will remember. Making sure you get all the small details for your getaway car is important too. If you want your car to really stand out, a great way to add that extra touch is to also apply flowers or decorations to your door handles. You can keep things simple with a small bouquet or roses, or you can add more drama with beautiful ribboned ones. You can also get creative with placement to makes things stand out more. Try putting flowers on the roof of your car, or on the side view mirrors. If you want to make your car completely decorated, put flowers in the more conventional places like the hood or trunk of the car, then add even more decorations on the door handles, side mirrors, and roof. Finally, one of the most important parts of the getaway car is the classic trail of ribbons or bells following behind the car as you drive off to your romantic getaway. Attaching a cute “Just Married” sign is a must have, and attaching it to the car as a temporary license plate is a creative idea that many brides love. You can get really stylish and fun with this. Show off your unique style with our different accessories specifically for the dramatic getaway effect. Don’t forget that you can always DIY your getaway car decorations to make them more personal using our DIY materials. Congratulations on your upcoming wedding! Steering wheel covers are a great option for any girl who wants to add instant style to her car and keep her car staying fresh and new. When you are looking for a steering wheel cover it is important that you pick one that is both safe and stylish, so before you purchase a steering wheel cover there are a few things you should know so that you can make the best choice. Your steering wheel should fit snuggly on your steering wheel so that it doesn’t move while you are steering. Carsoda.com steering wheel covers can be customized to fit your car’s steering wheel perfectly. Just send us your measurements. To measure you steering wheel, measure around your steering wheel’s outer rim (the circumference) and the width from one side to the other (the diameter). This will help make sure your cover wont be too loose or too tight. If you are not sure what size your steering wheel is, you can check out this sizechart. Luckily for you, all Carsoda steering wheel covers have a lining that provides the most grip possible, so you don’t have to worry about grip when shopping on our site. Having a steering wheel cover with a good grip is great because it ensures that your steering wheel will never slip or slide while you are driving. We care about your safety and we would never want that to happen. The material you choose for your steering wheel cover is more important that you might have thought. Different materials work better for different drivers. Leather is great option for any environment because it has a natural grip and it lasts long. Fabric or furry material is great for anyone who lives in a cold climate, since it wont feel cold in the winter. Keep these details in mind when you are picking a steering wheel cover so that your car is stylish and safe. A girl needs to personalize her car to make it her own. A guy can get car accessories to make it macho and masculine, but where can a girl make her car girly? If you’re on the lookout to get amazing girly car accessories this Mother’s Day, then www.carsoda.com is the place for you! It stocks trendy and fashionable items that will add the bling to your mechanical thing! Car Accessories are gaining more traction with drivers all over the world and www.carsoda.com brings to you beautiful girly car accessories that will wow the special lady in your life. Mother’s Day is around the corner and what better way to express your love and appreciation for the woman in your life by showering her with gifts by taking the bling in her car accessories up a notch. Help your mum find the perfect girly car accessories from this website that is wholly dedicated to helping women find items to decorate their ride. 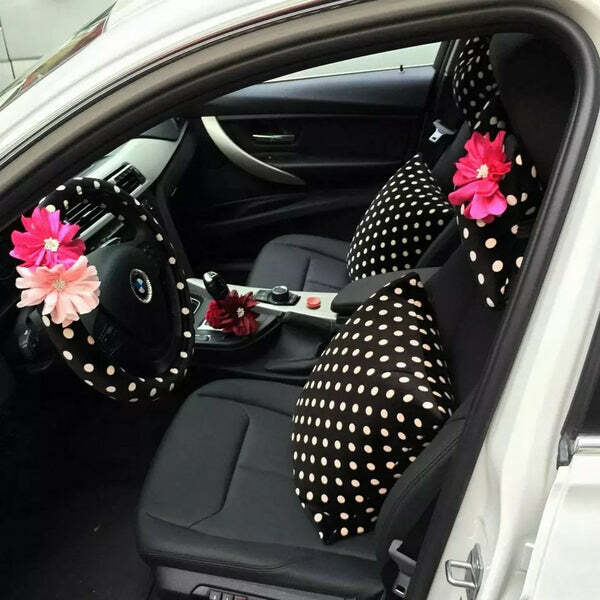 Your mother would definitely love the products in the catalogue and you can surprise her with a polka dotted steering wheel cover, or a bling car rear view mirror cover that transforms her car’s interiors into something totally fashionable. A car’s interiors can sometimes be very boring, as all factory made interiors have the same look. If your mother would like to personalize her vehicle with her own unique personality, surprise her with a gift from the girly Bling collection like our bling your ride rhinestone crystal flower air vent decoration or our pink bling bunny car air vent mounted accessories. From a Hello Kitty styled decoration to butterflies, a delicate fairy to a bunny – these fun but fashionable decorations are just the accessory every girl needs! The Bling would add the Oomph factor to her car and the best thing of all, these classy styles would transform her car into a statement that will make all the other ladies green with envy. If Bling is not her thing, introduce her to the polka dotted steering wheel cover with chiffon flowers. This product is the perfect combo of girly yet stylish and will blend in well with any car’s interior. 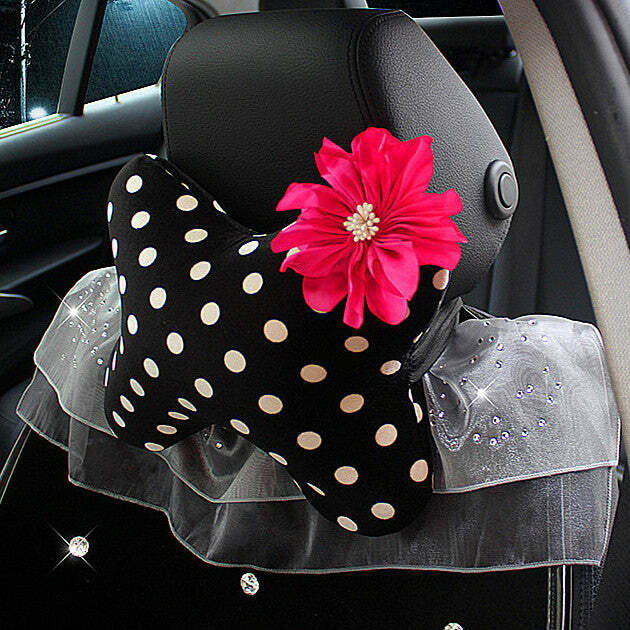 Or if she would like just a small feminine touch, this daisy flower car accessories air vent decoration is the perfect touch. It is small, but beautiful and brings in a touch and look of the outdoors to the interiors. These products emphasize femininity and are so realistically hand crafted, that you will be hard pressed to know that it is not real. Even the trash in her car can get a stylish home with the bling your ride pink crown leather rhinestone water resistant car trash can. You’ll definitely be adding a girly touch to her car with this item. Not only is it extremely stylish, it is also practical with its water resistant property. Styling your Mother’s car is not a new thing, but with these amazing funky products from www.carsdoa.com, decorating a car’s interiors has never been easier. In fact, many car companies and girly car accessory companies have gained a lot of popularity over the years, and if the special woman in your life loves shiny bling things, faux leather, flowers, polka dots or more, you really needn’t look any further. Driving need not be the same again with all these lovely girly car accessories. So make this Mother’s Day special for the special woman in your life and shop at www.carsoda.com! Car anytime makes an ultimate gift. But then who settles down for anything less. Obviously your teen would like to make the space her own as much as she can by personalizing the car to match her own taste and personality. Regardless of whether you have observed or not but your child will be more interested in how the car looks than how well it runs. If you want to help your teen add her own personality to her car, you can help her easily. There is a complete website dedicated to helping young women and teens find accessories that will help them decorate out their ride their own ways. Carsoda.com offers wide array of options for young teens to personalize and make their space their own. Carsoda.com makes it easier than you think to help your teen daughter with girly car accessories so that she can add her own personality to her car. If your daughter is driving an older well loved car, she would definitely appreciate any effort that goes towards making the car look new. You can help her give a re-touch by gifting her a set of bow style pink car seat covers, A Polka Dots Steering wheel cover with Chiffon Flowers or a matching Bling Car Rearview Anti Dazzle Mirror with Multicolor Rhinestones crystal Rear View Cover. You will find almost all of the auto accessories at Carsoda.com that a girl need to add her own style and comfort to her wheels. If your daughter wants to customize her car with her personality, she will surely like the most sought after collection of girly Bling Your Ride-Rhinestone Car Air Vent Bling Decoration or Crystal Flower Air Vent Decoration. These are universal designs and will go well on any car or SUV. At Carsoda.com, you will find some of the most popular Rearview Mirror Rhinestone crystal Cover Rear View to decorate the car by adding color and style. Another excellent option is to add Pink Bling Bunny Car Air Vent Mounted Decoration that is both decorative and functional. At CarSoda.com you will also find Hot Pink Camellia Car Air Vent Bling Pearl Pendant available in a variety of styles, which is excellent for a newer model. In fact you can add a thrill by giving a twist with a Bling Car Rearview Anti Dazzle Mirror with Multicolor Rhinestones crystal Rear View Cover. This was just a sneak peak of what you can expect to fund at Carsoda.com. In fact once you visit the website you will explore variety of other ways in which you can plan fun girly car accessories and unique graduation gifts ideas.